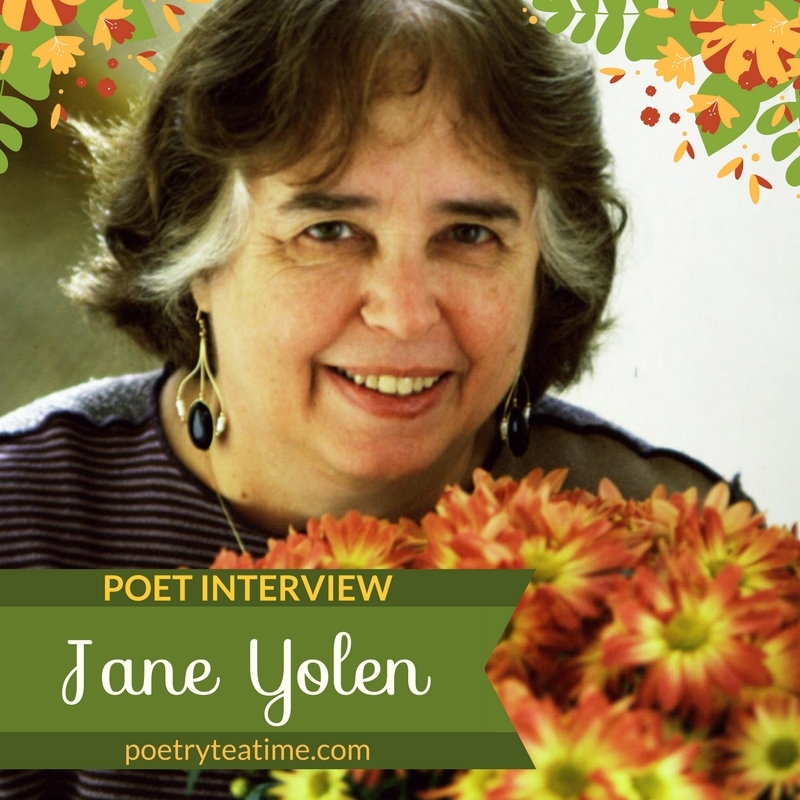 Today we would like to welcome to Poetry Teatime one of the most prolific writers of children’s fantasy and poetry, Jane Yolen! Check out Jane's written interview and listen to the podcast with Julie Bogart below. Plus enter our FUN GIVEAWAY for a chance to win three books by Jane (UPDATE: Winner announced below)! 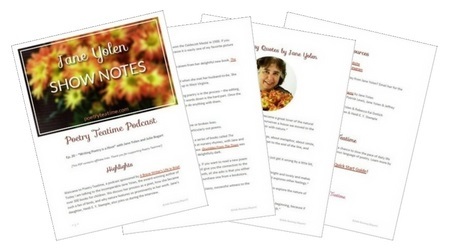 Jane Yolen has written over 250 books and has been writing since preschool. She has been called “America’s Hans Christian Andersen” for her many fairy tale retellings and fantasy books. 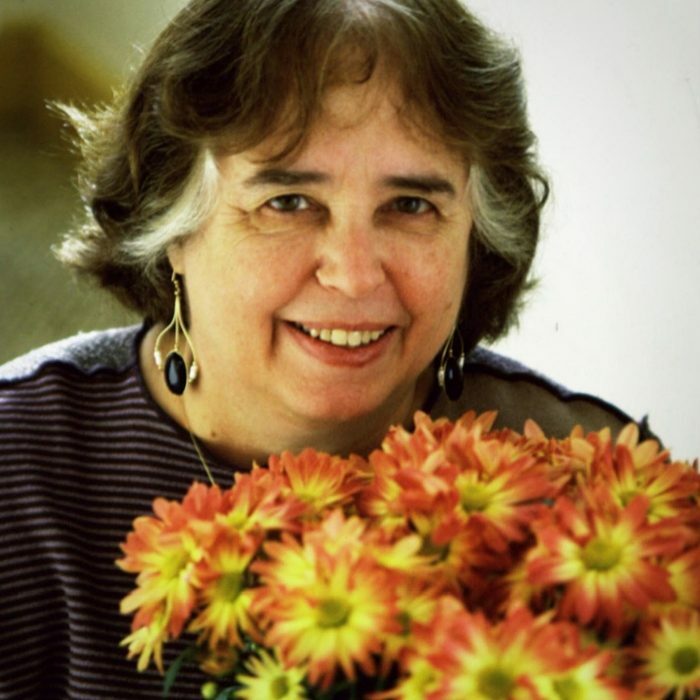 Enjoy the conversation between Julie Bogart and Jane Yolen on the Brave Writer's Life in Brief podcast. They explore poetry, writing, nature, and the celebration of family culture! Jane, welcome! First of all, there was no such thing as young adult literature when you first began to write. In some ways, your work helped shape the genre. What do you think is important about YA lit today? I think I had little to do with shaping YA lit except by being in publishing then and recognizing what was happening. I had written a few children’s novels, not what would become classic YA—S.E.Hinton and Robert Cormier were the true change-makers. But Devil's Arithmetic, which came twenty years later, opened up a different kind of tough time travel novel that set a child directly into a difficult period of history. Yes, it had been done before, but more playfully. Mine spared no reader. You’ve worked with your own children before to craft some of your books. How does that process work, and what are some ways that parents and children can collaborate in writing or reading poetry and fiction? As readers we share our interests, preferences. Adults need to be aware of what a reading child likes and go from there to expand the base. Writing together is different. What is the premise? What are each writer's strengths? How do we make two (or three or more) voices one? Who gets final say/final pass over the written piece? How are conflicts resolved? Where does poetry get its power? Tell us about a poem that has changed you. Yeats' "The Second Coming" still gives me shivers and though written almost a hundred years ago is as relevant today as then. It is both political and historical, it is challenging, and it has one of the greatest last lines in a poem I know. Emily Dickinson's "Tell All the Truth But Tell It Slant" is the mantra of my writing. It means everything to me. Lewis Carroll's "The Jabberwocky" from the Alice in Wonderland books because of its playfulness and singability and perfect rhyming and because it allows me as a poet to make up words as he did. You used to dance at the Balanchine School of American Ballet and drew on this influence in your book The Firebird. What are the connections between dance and writing? Do you think dancing made you a better writer? I think that too many would-be poets tend to sit around thinking poetic thoughts and not getting much exercise. But poets need to be out there, looking and feeling and touching the world. They need to be able to flex real muscles as well as mental muscles. They need to be observers and participators. You’ve said that you want your writing to surprise you. How does your poetry surprise you? I may start with a word or an idea and think I know where a poem is going and then it goes sideways or south. What fun that is! It's the lizard brain, the subconscious, the poetry muscle flexing. Some of your books, like Briar Rose and your book-in-progress House of Candy, merge the shimmer of fairy tales with the darkness of the Holocaust. Do you think fairytales do a better job than most stories in communicating darkness? I think fairy tales let us access that darkness, explore it, without actually becoming dark ourselves. It tells us the story of darkness—troll, witch, blood, spell—but in a coded, metaphoric way. What’s one writing dream that you have yet to fulfill? Well, I have written a verse novel and then the beginning of a second one. But since I haven't sold the first one, I haven't done the deep revision work with an editor yet. Hoping that will happen. Other than that—I have done pretty much everything I have ever wanted to try in writing. But then I am 77 and have been publishing since I was in college, over 55 years ago. Thank you so much for joining us, Jane! 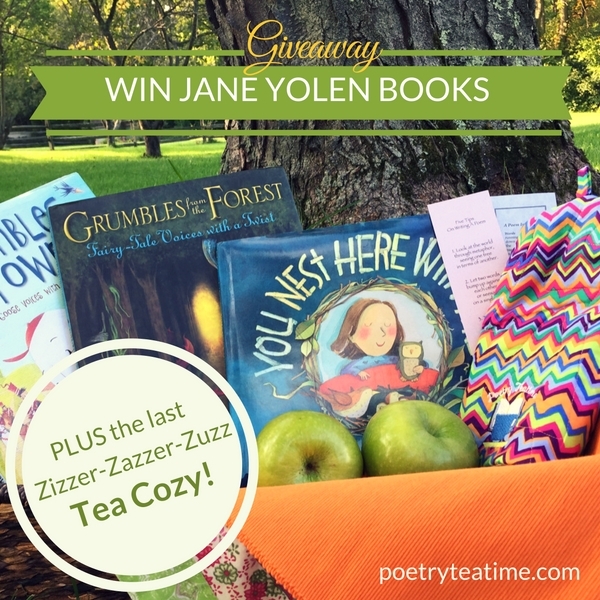 Check out our AWESOME GIVEAWAY featuring Jane Yolen's brand new book, Grumbles from the Forest, and two others! PLUS we discovered one last Zizzer-Zazzer-Zuzz tea cozy and are including that too. Learn more below! ...plus the LAST Poetry Teatime Tea Cozy called the Zizzer-Zazzer-Zuzz (sold out pattern). BONUS Surprise: Two bookmarks from Jane!